Why yes, I will be doing NaNoWriMo this year! 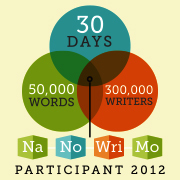 As you can see, I've officially signed up to take part in NaNoWriMo. Yay! I've actually taken part--and won--several years, but I couldn't last year because I was busy with edits. BTW, if you're taking part this is ME! I'm actually going to be writing the first draft of Sierra Fox #4. Since I just finished the third book, I think this is a great time to get stuck into the penultimate installment of Sierra's series. And I'm really excited about it. Scenes from the book keep popping up inside my head and I've been writing everything down so I don't forget. I mean, I know most of what's going to happen in this one but the nitty-gritty is really starting to take shape, which is an incredible (magical) thing. Love it! So, I won't be working on anything too involved this week and half of next week. I've got a little research I want to get done, some decluttering, spring cleaning, reading, and other miscellaneous things I want to tackle before getting stuck into NaNo on November 1st. There are still things for me to do, but nothing as crazy as trying to write a book in a month. LOL. How was your weekend? We had a great one. Went out on Saturday because we had a few places to go and things to buy, then Sunday was mostly a relaxed kinda day. It was awesome! The weekends always are. I just hate it when they're over... :( Oh well. There's another one to look forward to now.